Hoop grip how it helps. 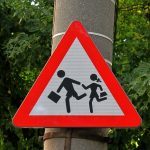 When all of the video deadlines, flow gatherings, partner projects, performances, sponsorship opportunities, and personal goals start to pile up, it is easy for a hooper to start to slip. 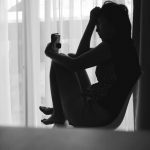 Hoop grip can help you avoid a common problem. The most versatile option that will give you a solid hold on your hoop is grip tape. 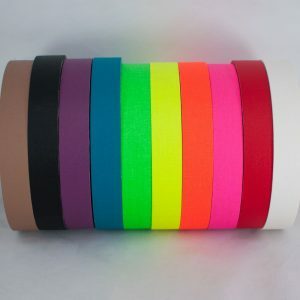 Grip tape comes in various types, sizes, and colors for customization. You can line the inner or outer rims, or spiral the tape for 360° friction. With any tape, you can expect that it will eventually wear off, get dirty, or leave an unpleasant residue on you and your hoop. Some hoopers find this more annoying than others. 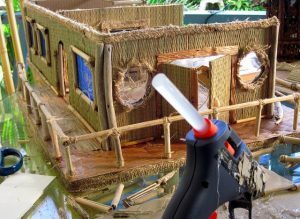 Combat this by intensely rubbing the remainder of glue off with your fingers or by sanding, the friction should heat the glue and remove it. If that is not enough, Goo Gone works wonders. The beauty of taping your hoop for grip is that you can always re-tape it or choose to leave it off and keep on hooping. In addition, tape undoubtedly adds a personal touch while being very effective. You can apply tape yourself, or have a pro do it for you, if you are going to do it yourself it helps to have some guidance on how to ensure that your tape job comes out even. This video gives some pointers on how to accomplish that. Taping is a common solution to the hoop grip problem, there are a few additional options in the category. Gaffer tape has been the most widely used grip option for hoopers. This tape is less grippy than the 3m but is still very effective and is the most decorative of all the hoop adhesives. It comes in ¼, ½, 1” or even 2” widths and a rainbow of hues, florescent colors, and glow in the dark shades. It looks great on bare polypros and adds the perfect accent to taped hoops. Almost every hoop supplier conveniently sells gaffer tape already on taped hoops or as an add-on. This tape can also be found online and is inexpensive. You can find it on amazon by searching "gaffer grip tape"
3m is the new craze in grip tapes. 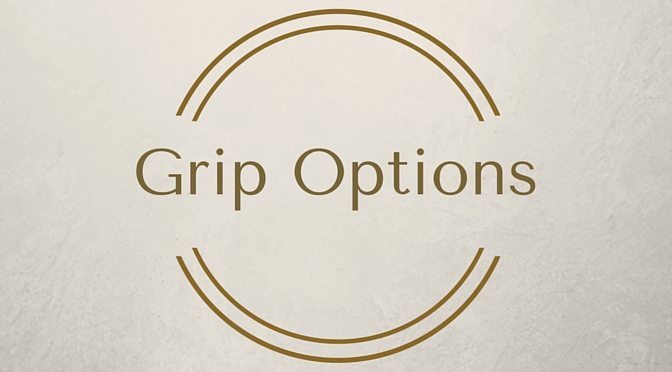 This is probably the strongest grip option available for now. The tape is covered in thousands of tiny bristles that grip your clothes almost like Velcro. It usually comes in black or clear although other colors can be found in stores online like Amazon. You have probably seen this adhesive used on ramps, pool decks, your grandma’s bathtub perhaps, really any area where slipping is a hazard. With 3m tape you can feel safely assured you and your clothes will be securely anchored to your hoop. Currently, not many hoop companies or even hoop supply companies carry the basic colors just yet. However, as it gains traction in the hoop community, that will most likely change. A trusty way to permanently add more hoop grip by using regular sandpaper on the inside circumference. Yes, any local hardware store will sell this hoop product! 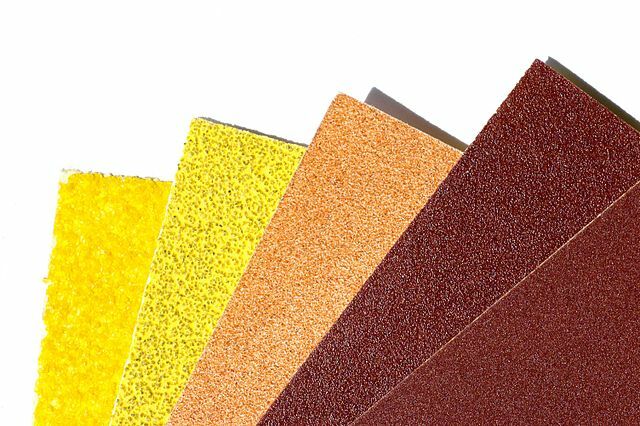 You can choose the strength of grip by using different grains of sandpaper. The lower the grit number, the more coarse your sandpaper will be. We recommend 60-80 grit. Start with light pressure and high grit if you are unsure of how coarse you want the plastic to be. Although the outer rim will naturally sand itself as it ages, you can further progress with body rolls and vertical manipulation by sanding it. When purchasing from a hoop shop, sandpaper is often an add-on option. You can often pay a small fee for them to sand it for you. Otherwise, a few squares of paper will arrive with your new hoop. Unless you have experience with sanded hoops, it is not recommended that you buy one that has already been sanded. Remember, sanding is irreversible, afterwards tape and wax will not work on the plastic. 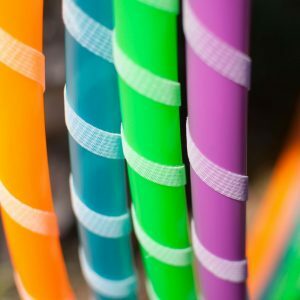 Depending on the tubing, it may also alter the look of your hoop. Iridescent or color morph plastics, for example, will look matted when sanded. The scratches are also more susceptible to trapping dirt. However, good news is that the more you get jiggy with your sanded hoop, the more the sanding will wear down. Then you can reapply and your hoop will remain bare and have better grip. Wax has been used by surfers for years to help them get grip while surfing, now we are applying it to hoops as a new grip option. Wax can be found online and is sold as a small morsel or “stick” and is super lightweight and easy to apply. 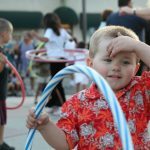 The idea is that when wax is heated and rubbed on a hoop, it leaves a light film that creates some favorable friction for your dance desires. This thin layer of wax is super lightweight and will not leave sticky residue on you or your clothes. Another bonus is that the wax is transparent which makes it perfect for LED hoops. Some ways to heat the top of the wax include running it under hot water or taking a hairdryer to it. For a thicker layer, try putting the wax in the microwave for a few seconds. Warning: the microwave will heat the entire segment of wax so it will be very hot. Use protective gloves and less force when applying it to your hoop. Wax can be easily removed with rubbing alcohol or Goo Gone. 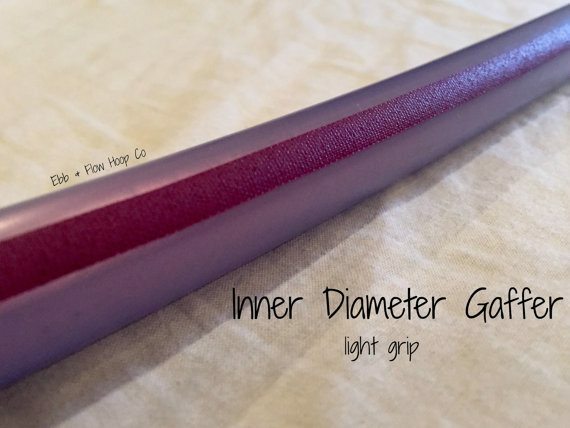 The only foreseeable downside is that wax usually requires more frequent applications than other grip options and with such a small portion available for purchase, you might want to stock up on more than just one at a time. 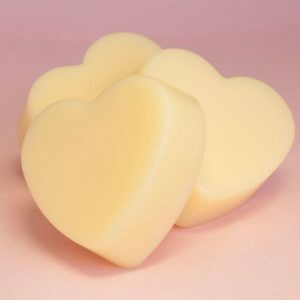 Currently, Moodhoops sells heart shaped wax that hoopers have deemed super effective, long lasting, and can even be applied to taped hoops without damaging them! Some hoopers have successfully used hot-glue-gun glue as an alternative to wax. Most hoopers can probably already find it in their craft box at home or at just about every craft store. When applying, do NOT use the gun. You want the little refill sticks. This method works with or without heating the glue. First, try rubbing the stick on the hoop and testing. If it is not sticky enough for your taste, heat the glue with hot water or a hairdryer to apply a thicker layer. This can also be removed with Goo Gone or rubbing alcohol. It goes on clear and will not stain your clothes. Hoopers are becoming increasingly more appreciative of waxy substances because is the best way to effectively add grip without physically changing bare or taped hoops! 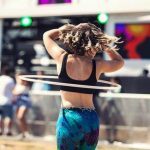 A lesser known but surprisingly effective hoop grip alternative is actually your bare skin. As long as you can shed layers you may never need to add extra grip. Your skin’s natural oils, combined with your body’s memory of the hoop’s weight and feel, make for an organic connection. Granted, this method is not as secure as the previous ones stated, but it is an undeniable (and cost effective) force. Not to mention, as the hoop ages, it will naturally gain some scratches and scuffs from concrete or gravel, adding some extra grip. Leaving your hoop like this allows for better ghosting isolations, improves smooth transitions, and inspires freedom and flexibility in flow. Each method has value in its own; what might be good for polypros might not be good for LEDs or taped hoops. The same argument applies to each hooper’s preference and is reflective of their style of flow. Dance based hoopers would probably benefit more from the strength of 3m tape to nail those tricky shoulder duck outs. Trick oriented hoopers would probably appreciate sanding or wax to keep the hoop light, and some stylish performers would deem colorful tape the most useful. The truth is however, no one fits completely into one category, nor should they be bound to one. 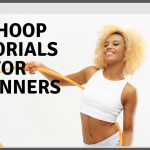 Our short answer: buy lots of hoops so you can try it all.